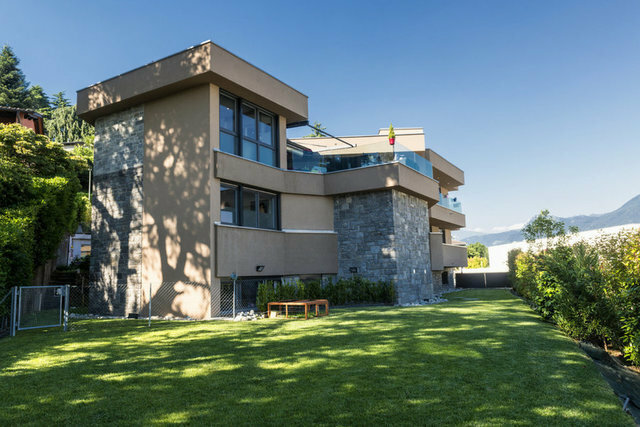 This beautiful, modern-style villa is located in Breganzona, in a very sunny and peaceful area facing south-east, with unrestricted panoramic views of the lake and the surrounding mountains. The villa, which was completely renovated in 2008 with luxury finishes and materials, is now in very good condition and offers a living space of about 400 sq. m. on three floors connected by an internal lift. The living area has direct access to a 46 sq. m. semi-covered terrace. The villa comprises: Ground floor: entrance hall with access to the garage, a guest bathroom, a large wardrobe room, an extra room, a bedroom, a laundry/ironing room with access to the garden and the boiler room. First floor (sleeping area): two bedrooms with access to a balcony, a bathroom with bath, a large master suite with wardrobe room, en suite bathroom and access to the balcony. Second floor (living area): a large living room with direct access to the semi-covered terrace, a dining room and a fully-equipped eat-in kitchen with access to the terrace. 2 parking spaces in the garage and 2 parking spaces outside. Air conditioning system and temperature control in every room. The property also features a garden with automatic irrigation system and exterior lighting, where swimming pool can be built.